Agnes Vicari became one of the first names of the dead to emerge from Bay County last week, five days after her body was pulled from the rubble of her coastal home. In the final hours before Hurricane Michael crumbled her Mexico Beach home around her, Agnes Vicari was on the phone with her niece with a promise. "I made a mistake. I won't make a mistake again," she told Joanne Garone Behnke the morning the storm hit. Vicari, 79, who lived in a small one-story home just yards from the Gulf of Mexico, promised she'd evacuate the next time a storm came, that she'd see them soon to celebrate Behnke's husband retiring. "Aunt Aggie, you can still go to a shelter," Behnke begged. "There are no shelters in Mexico Beach," Vicari said, before the call ended. Vicari became one of the first names of the dead to emerge from Bay County last week, five days after her body was pulled from the rubble of her coastal home. The medical examiner for the region has confirmed at least 15 deaths in Bay, though names have yet to be released in full by local officials. The epicenter of Hurricane Michael's path of ruin, Bay has struggled in the days since to restore cell connections and power. Even the medical examiner's office has had water and power issues as it identifies the decomposing remains of the dead. In Mexico Beach, where the storm's worst came ashore, the magnitude of the destruction is nearly absolute. Rescuers and residents have described it in terms of a nuclear bomb. 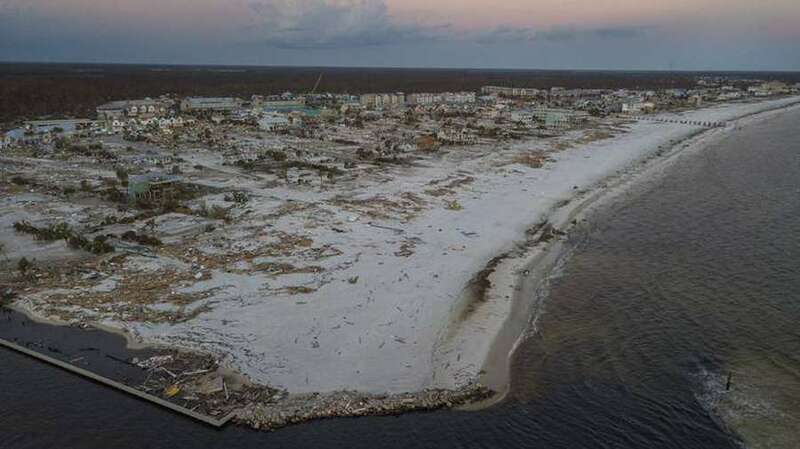 But many of the deaths attributed to the storm have come in the chaotic aftermath — Vicari, one of the few recovered in Mexico Beach, is a rare direct casualty of the storm. It was in search of a sliver of peace that Vicari came to the touristy, seaside township several decades ago, seeking a permanent haven. She was born in 1939 in Brooklyn, New York, the oldest of three sisters in an Italian-American family. After her brother-in-law died unexpectedly of cancer in 1965, she moved with her sister Josephine and her family to South Florida in 1969. Vicari made a home for herself in several neighborhoods in Miami-Dade, bouncing from Westchester to Kendall Lakes to Village Green, working as a telex operator for Texaco. But in the early 1990s, Vicari wanted to escape what had become Miami's frenetic pace. She found it in a small affordable beach bungalow in Mexico Beach bracketed by the marina, its boat canal and the sprawling Gulf, just two houses down a narrow concrete road that led from the sea. Behind the squat house with the pale blue sloping roofs, she grew flowers, vegetables, anything that would sprout and flourish. She doted on her granddaughter growing up nearby in Port St. Joe. If she walked out of her house and looked right, she could see the bright spit of sand next to the water. She was "a simple, sweet soul," said Behnke, 54. "She was somewhat of a person who kept to herself." When Hurricane Michael began to churn into the Gulf two weeks ago, her family begged her to leave. Her pilot nephew called the day before the storm. Her granddaughter, who evacuated north to Wewahitchka, asked her to do the same. Even a police officer stopped by. She chuckled at them, Behnke remembered. "She was still struggling with the concept of getting in her car and going somewhere," she said. "She's an old-time Italian, kept her money in her house, very stubborn." Her somewhat reclusive aunt might also have not wanted to go to a shelter, she added, "probably afraid of leaving her home where she had her sense of security." The Wednesday the storm hit, Behnke called Vicari around 11 a.m. Vicari worried about the storm, which had strengthened to a Category 4 overnight. But as it approached, she sounded hopeful she would see her family soon. "My aunt didn't want to die," Behnke added. "She didn't think she was going to die." The storm made landfall early that afternoon. The crews that saw Mexico Beach in the next day's dim light found a flattened plane of devastation without end. As the first search-and-rescue sweep gave way to dogs, to listening devices, to crews digging through the hollowed-out homes, Behnke hoped. Could someone have survived this? Her hopes were buoyed when other searchers heard from a fire chief that an Agnes might have been airlifted out of Mexico Beach. She called every hospital she could in Florida and Alabama and tracked down the fire chief, who pointed her to an emergency disaster response team called the "FLip FLop FLoatilla." But a man in that group said he couldn't be sure that the person who was airlifted was her. "There's all these highs and lows, there's all this anxiety," she recalled. "There was mass confusion." Five days after the storm hit, Behnke learned they had pulled a woman's body from the scattered cinder blocks and crumpled siding on 38th Street, the same narrow road that stretched from Vicari's home to the sea. "Nobody could give details — the people I had been in close touch with basically thought that she fit the parameters," Behnke said. They waited nearly a week until Friday afternoon for the medical examiner to confirm the body pulled from the rubble was indeed her aunt. Behnke had hoped the identification might happen sooner, but said, "I don't blame anybody. I can't imagine dealing in these types of circumstances." When they found Vicari, her home had been leveled by the storm. But the destruction, incomprehensibly, spared the two houses in front of Vicari's. A condo building one house over stayed standing, too. "It just kills me that she didn't seek refuge in one of those places. There wasn't anybody there as far as I know," Behnke said. "It just seems such a senseless way to die." She added her aunt should have left, but she thinks about all of the small factors that meant Vicari was swayed to stay until it was too late: the belated strengthening of the storm, her shy nature, her comfortable life alone. "There were so many extenuating circumstances that intervened." Her family hopes to hold a service in November in Mexico Beach, where her house once stood, Behnke said. Vicari is survived by several family members, including sisters Josephine and Geraldine, daughter Gina, 57, and granddaughter Lilly Meizner, 19. Behnke says she worries for people like her aunt in the path of future storms, that she hopes people who might question evacuating might "be more prudent, err on the side of caution" after learning what happened to Vicari. "Maybe this is a story somebody's going to hear," she said. "Maybe lives could be saved." Behnke has tumbled through could-haves, should-haves, would-haves endlessly since the day the storm hit. They could have tried harder to convince her. They could have driven there and forced her to get in the car, away from her home. She imagines the first outer bands knocking against her aunt's house, bringing down a fence, blowing away a shed, cutting the power and the cell signals tethering her to her family's pleading calls. But she stops there. Before the worst of the rain, the winds or the storm surge her family knew the walls might not hold at bay. "You can really drive yourself crazy," she said late Friday. "It's not a picture I want to continue. … I have nightmares you would not believe."